Disney Princesses are going to High School for the first time. Unfortunately, young Princesses have no idea what to wear. They tried on many different clothes, but nothing looks as they want. 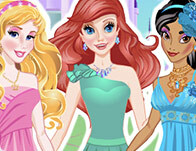 Lucky for them, Princesses heard about a fashion expert who can find the best outlook for the each of them.